It’s safe to say that, when it comes to SEO, keywords are essential. However, most SEO agencies will tell you that the best strategy is to focus on a combination of important keywords, as well as long-tail options that get less traffic, but are easier to position for. 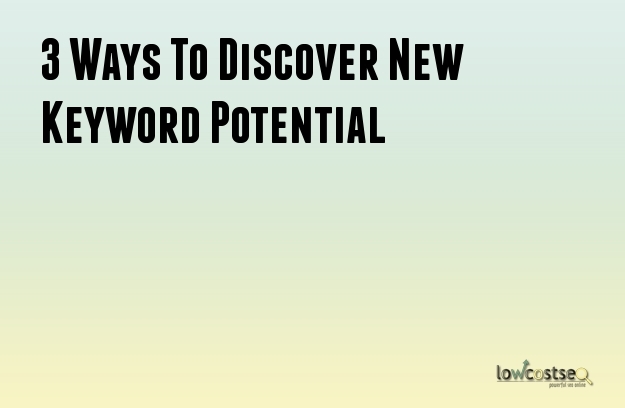 Of course, you should also always be trying to find new, unexplored keyword options. This will help you get an edge over the competitors, finding queries that are seldom targeted, allowing you to easily get a better position. So, here are 3 ways to help you do that! How would you describe your product if you didn’t know the technical terminology? For example, as an obvious example, you might sell the world’s finest “chaise longe” but not everyone knows what that it is. For many people, they may very well start their search with “sofa”. This, of course, is an obvious case, but what if your product has an easier explanation? Try and define your product or service as simply as possible. Figure out what they are searching for in terms of questions, not products. Sometimes your product is not a “bespoke, custom, electronic appliance”, it’s a “device to control lights”. while someone looking for a blender might look for “kitchen appliances to stay healthy”. Do some keyword assessment and try to think like your customers. Want to know how customers refer to your business? Try using feedback forms, looking at comments and checking e-mails. See how customers refer to your business, or what questions they ask. This is a strong indicator of potential keywords. If enough people are using these terms, then there must be some merit to them. This is the sort of logic that goes behind an FAQ page. In terms of website optimisation, this lets you place the obvious questions into one page, allowing them to be crawled, recognised and ranked by Googlebot. However, really powerful responses can make their own pages, or even used as H2/H3 headings. Want to find questions people are asking in your niche? Head to the forums! Internet forums are a great source of SEO potential. In addition to posting links, you can also read some important questions. If someone has asked something in the form of a new thread, there’s a good chance he or she has searched this in Google. If many people join in the conversation, that suggests there is an audience for this question, so why not make some content to provide the answer? This also applies to social media and, in general, any place online where people can gather to share thoughts and communicate. Here you can either see common, reoccurring questions, or simply useful phrases within someone’s text.